OUR STORY – Growing Up in the Heart of the Safari Industry! With over thirteen years in the safari tourism industry, our founder was offering customized travel experiences in East Africa long before Wito itself was born. Wito Africa Safaris is an overflow of Abdullie Mfinanga’s natural passion for handcrafting once-in-a-lifetime experiences, and his genuine love for people, wildlife and conservation in Africa. Born and raised in the heart of Safari land (Arusha, Tanzania), Abdullie was introduced to the untamed African wilderness at a very young age, and his heart for tourism and conservation was deeply-rooted in him by his grandfather, a reputable head safari guide in the 1970s. He has vivid memories of his grandfather’s guests, who were often hosted at his family’s house, being brought in on the famous old Volkswagen Kombi (world class safari vehicles back in the 1970s!). Creating Authentic Luxury Travel Experiences For Guests From All Over The World. Abdullie got his early start in the industry from his late brother Naseeb, who showed him the ropes and fostered in him his deep love of the Tanzanian wilderness. Intent on pursuing his life’s passion of bringing people from around the world to experience the beauty of Tanzania and East Africa for themselves, Abdullie graduated from the Marketing and Tourism Management Advanced Diploma program at the British Columbia Institute of Technology in Vancouver, Canada. 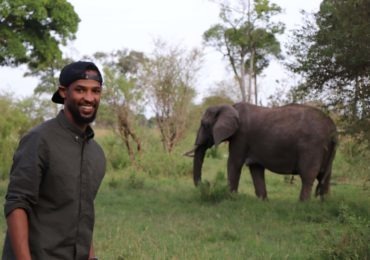 After gaining valuable work experience with travel agents in Vancouver, Abdullie moved back to Tanzania in 2013 and worked alongside his two late brothers, who were among the best guides in the country. an elephant browsing in the northern Serengeti – one of many unforgettable travel experiences that Wito Africa organizes in Africa. In his role as Sales and Marketing Director for his late brother’s collection of tented safari camps, against the stunning backdrop of Serengeti and Tarangire, Abdullie explored all angles of Tanzania’s remarkable national parks and nurtured strong relationships with property owners, personnel, local suppliers, and some of East Africa’s most renowned safari guides. He successfully elevated the company’s international profile by exhibiting at leading travel shows around the world, including; We Are Africa [South Africa], the Travel and Adventure Show [New York, Los Angeles, San Francisco], World Travel Market [UK, South Africa], ITB [Berlin], INDABA [South Africa], Karibu and Kili Fair [Tanzania] and the Magical Kenya Travel Show [Kenya]. Prior to establishing Wito Africa, Abdullie was a co-owner of a luxury boutique safari company based in California, where he played a key role in growing the young company. Over the last thirteen years in the safari tourism industry, Abdullie has touched every corner of his beautiful country of Tanzania; from the roof of Africa at Mount Kilimanjaro, the white sandy beaches of Zanzibar, and the stunning Mahale Mountain, to the endless plains of the Serengeti. He also enjoys drawing inspiration from his travels across five continents when crafting unique experiences for his own clients. He has developed a commitment to responsible eco-tourism, which he sees as a way to make a difference in the lives of local people, while simultaneously promoting a sustainable environment for endangered wildlife.